"A Good Place to Sit"
Ahh, Lake Tahoe. A slice of Heaven on Earth. I took this image in Zephyr Cove, which is on the Nevada shore, at sunset during a break in our most recent set of storms. This may look like a photo taken with a full-frame sensor DSLR, but it is not. It is actually a panoramic stitch from 5 vertical frames. If you want to see how I process my HDR panos, check out the free video tutorial I made down below. I usually try not to have any human-made objects in my nature photos, but the bench here really worked with the scene. Also, I thought the tiny snowman towards center-left was pretty cute. Lake Tahoe is probably one of the more heavily touristed naturally beautiful areas I've ever been. Much of the shoreline is privately owned, and that which is not is usually a bit more trafficked by people. So, wanting to remain true to my location, I decided to make lemonade and incorporate the human-made features. (between you and me, I suspect that much of the beach and sandbar at Zephyr cove was constructed anyway). Also, if you look closely you can find the edges of a rainbow equidistant from the sun just above the horizon line. 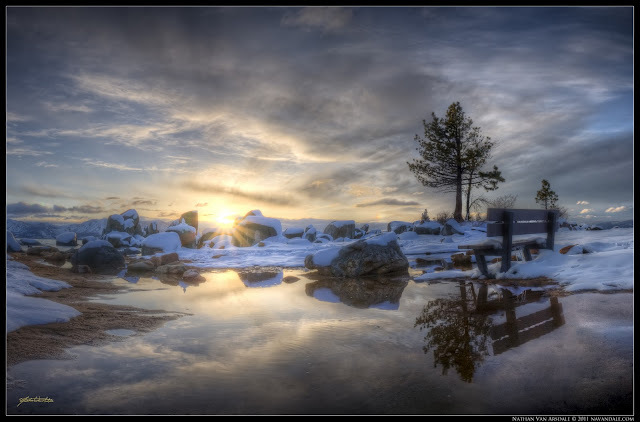 How to Create an HDR Pano using Photomatix Pro's Batch Processing and Photoshop's Photomerge. from Nathan Van Arsdale on Vimeo.